Request for light in classrooms. Bitumising of paths and quadrangle (this is a very sandy area and the caretaker had difficulty keeping the building clean especially when the South Easter was in full cry). Power plugs were required in the Kindergarten classrooms. The growth of the school was rapid and in March 1951 the Principal anticipated an enrolment exceeding 500. The Education Department was to be requested to provide prefabricated classrooms. At this stage it was also felt that the school be declared an English Medium school as the area was predominately English-speaking. In 1951 application was made to the Department for Junior High status as parents were experiencing difficulty having their children enrolled at high schools (Bergvliet High School had not yet been built). EARLY GROWTH Mr. T. Walters was appointed as Special Grade Assistant. In July 1953, two music teachers were appointed. Mrs. Steenkamp and Mrs. Dose occupied these posts. In 1953 the school was entitled to a Vice-Principalship. Three members of staff were eligible and applied for the vacancy which was subsequently filled by Mr. H Woodcock. Another Special Grade post became available and was filled by Mr. D Schoonraad. He was a mature man and served the school well, until his retirement in 1967. In 1954, the committee agreed to the systematic raising of funds to construct a hall. Parents were requested to donate R2 per term in addition to the normal levy which they paid. Application was made to the Department for the construction of two music rooms and a speech therapy room. In 1955, application was made for additional ground on the South side of the school. The girls’ bicycle shelter had to be demolished to make way for the proposed new hall. 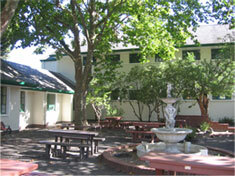 The hall (now the Media Centre) was completed in 1957 at a cost of R16 000. The Department contributed about R7 320. The official opening was in 1958. Due to lack of space the hall was not really big enough to serve the needs of the school. Nevertheless, it was an attractive building with large floor to ceiling sliding doors giving access to the quadrangle with beautiful shady trees. There was also an adequate stage, where Mrs. Cushny (Art) and Mrs. Davison produced pantomimes and plays. The growth of the school continued and the demand for admission grew steadily as the school excelled, not only in the classroom, but also on the sports field. Cricket, tennis, rugby and netball teams compared very favourably with the best in the Western Province. At a special meeting of the School committee, chaired by Mr. L Hyde, the Bergvliet Sports Association was approached with a view to obtaining the land between the school and the tennis courts. The aim was to develop this area into a Sports Centre. In 1963 there were proposals for the extension of the school hall (now the art room) on the south side. The purpose of this was to serve as a school library as the library was housed in a room which was far too small. There would be no wall between the hall and the proposed extensions, as this would, in a way, increase the capacity of the hall when maximum attendance was expected. Before the hall was built, prize-giving was held in the open. Sometimes 800 – 1000 persons attended. Men serving on the committee were expected to wear formal evening dress as were the male members of staff. In November 1964, Dr Loots examined pupils at the school and found that 24 were in need of special class teaching, and Mrs. Cleghorn was appointed to do this. In March 1965, Mrs. P Cotton became the first full-time secretary. She was extremely well-liked and served the school well until her retirement in 1978. The need for further accommodation continued. On 5 February 1968, the secretary of the school committee was asked to remind the department that the extra facilities previously requested were desperately required. The Principal pointed out that there was no staffroom, there were inadequate toilets for lady staff members, the special class was in the passage, two classes were held in storerooms and the pre-fabs were unbearably hot and the lighting poor. In 1967, Mrs. M C van der Westhuizen was appointed as a second Vice-Principal. The post was formerly held by Mr. D Schoonraad who had retired. Mrs. van der Westhuizen rendered excellent service to the school. Until her retirement in September 1979, she looked after the K.G section, taught music and singing and assisted with the production of operettas. In August 1969, correspondence was received by the committee in which it was learnt that the Divisional Council was asked to instruct their Conveyancers to pass transfer of land measuring 1,1911 m2 to the Education Authorities. The Bergvliet Sports Club was to be reimbursed an amount of R2 000. In March 1970, the following were considered in a development programme: six tennisette courts, two netball courts, one rugby / cricket field, an athletics track, one small pavilion, a well point with storage dam and an appropriate sprinkler system. In 1970 the school’s 21st anniversary was celebrated with a dinner / dance at Rhodesia-by-the-Sea, Simon’s Town: Cost R5 per couple. In 1971 tenders were called for in connection with new additions to the school. These were for a new hall, science lab, two special classrooms, medical inspection rooms, bookroom, needlework room and six new classrooms. This work was completed in 1972 and brought relief to the crowded conditions which existed before. In August 1972, a letter jointly written and signed by Mr. A Cape (parent) and Mr. Van Zyl-La Grange was received by the committee requesting the establishment of a fund towards the building of a swimming pool. After the usual negotiations the pool was ready for use in the spring of 1974. By this stage the school had acquired practically all the amenities associated with a modern primary school, especially an art room, library, huge hall, woodwork room, science lab, sufficient classrooms, adequate sporting facilities, etc. In December 1977, Mr. Breetzke retired at the age of 63 after 28 years service. His drive and leadership was appreciated and a school with a unique atmosphere had been created. Visitors, inspectors, parents, training college lecturers and students perceived, and often commented upon, the happy atmosphere which prevailed at the school. The staff have always been a happy and harmonious group of people. After Mr. Breetzke’s retirement, Mr. L Fourie, formerly of Tamboerskloof Primary School, was appointed (1978-1991). He was followed by Mr. R Street, formerly of Pinehurst School (1992-1999). Mrs. L.S.L. de Beer (formerly a Bergvliet Primary pupil from 1960-1967, Lynette Seaton) became the first female Principal at B.P.S. She commenced her teaching career in 1976 in her old Standard Two classroom, teaching Standard Two children! She became Deputy Principal in 1996 and Principal in 1999-2014.